Time is running out to meet our carbon reduction targets and the way we live has to change. A big part of that will be saying goodbye to our gas and oil boilers. But, without fossil fuels, how will we be heating our homes in 2050? Why Do We Need to Change the Way We Heat Our Homes? For hundreds of years we’ve been powering our homes, transport and industry with fossil fuels like natural gas, oil and coal. While these fuels have enabled us to take huge steps forward both economically and technologically, we can’t go on using these fuels forever. Not only are our supplies running out, but the long term environmental impact on our climate is now an urgent and international concern. In 2008 the UK government passed the Climate Change Act in an effort to tackle the issue. The Act makes it the duty of the Secretary of State for Energy and Climate Change to ensure that the UK’s carbon emissions are at least 80% lower than the 1990 baseline by 2050. The Act also gives ministers powers to introduce new measures to achieve these targets. Avoid unreasonable upfront costs for consumers which could discourage home improvements. So we need to make big, long term changes to way we power and heat our homes, but with minimal up-front costs and lower ongoing energy bills. Under the Climate Change Act came the establishment of the Committee on Climate Change (CCC), an independent advisory body which assists the government in reaching required carbon levels. Every year the CCC carries out an assessment tracking whether or not the UK is on course to meet its carbon reduction targets. This progress is reported to Parliament. The first carbon budget (2008-12) has been met and the UK is currently on track to outperform the second (2013-17) and third (2018-22) carbon budgets. In 2017, UK emissions were 43% below 1990 levels with most of the reduction in carbon is down to significant progress in reducing emissions from electricity generation. In fact, 2017 marked the first year that we generated more electricity from renewable sources than from fossil fuels. Note about the graph: “Low-carbon” includes nuclear, bioenergy, solar, wind and flow hydro. “Fossil fuels” includes coal, gas and oil. “Other” includes pumped hydro, which stores the grid mix of fuels, as well as non-renewable wastes. The UK is not on track to meet the fourth carbon budget which covers the period 2023-27. Legislation was put in place in 2018 to phase out inefficient gas boilers; the regulation now known as ‘Boiler Plus’ stipulates that all new Combi boilers installed must have a minimum energy efficiency of 92%. The UK government hopes to phase out the gas network almost completely by 2050, and in March 2019 it was confirmed that from 2025 it will be illegal to install gas boilers in new build homes. According to the National Grid, 8/10 homes in the UK are connected to the gas grid for heating, so what will the gas network be replaced by? In November 2018 the CCC released their most recent findings and recommendations for the future of UK heating with particular focus on finding an alternative to the natural gas network. The report suggests that the most likely solution looks like a hydrogen network. When burned, hydrogen produces no emissions and creates only water vapour and heat. Hydrogen is also very efficient as it contains a large amount of energy; 1kg of hydrogen has the same amount of energy as 2.8kg of gasoline. However, the report also highlights the need for careful planning as switching the gas grid to 100% hydrogen is impractical for zero carbon heat. The UK’s natural gas grid is extensive but it’s unlikely that reusing the existing grid entirely to burn hydrogen in domestic boilers as we do with natural gas today would be a viable option. The report suggests that the better tactic would be to combine different renewable technologies to provide low-carbon heat. Specifically, the CCC recommends that the lowest cost, long term solution is to replace the millions of gas boilers across the UK with hydrogen alternatives alongside electric heating (generated from renewable sources). Initially, householders would keep their radiators and gas boilers but the majority of their hot water would be produced by an air source or ground source heat pump (which run on a small amount of electricity to draw natural heat from either the air or ground) with the gas boiler there as a backup. To make heat pumps effective all existing and new build homes need to be made as energy efficient as possible with optimum levels of insulation. To reach the 80% reduction target, the next stage would be to replace the gas boilers with hydrogen ones. What are the Challenges of a Hydrogen Network? Switching from gas to hydrogen would be a huge project and carries a number of challenges. For example, hydrogen is generally considered hazardous as it’s highly flammable so this will need to be addressed for use in domestic settings. In addition, while hydrogen emits zero emissions when used, the process of creating it does produce carbon so a production system will need to be developed which captures the carbon so it doesn’t get released into the atmosphere. This can be done as currently around 90% of the world’s hydrogen is produced in steam methane reformers. This combines natural gas with steam, which separates the hydrogen and the carbon. The carbon is then stored so it is not leaked into the atmosphere. Another potential challenge the government face is the limited public awareness around the need for decarbonised heating and what would be involved in making the switch. To get UK homeowners on board with the changes the government need to address concerns around the hassle of a new installation, the unfamiliarity of a new heating technology and the worry that the new systems won’t be as effective as traditional boilers. There needs to be public engagement on the future of the UK’s heating choices. However, the window to engage with people is closing. A hybrid heating system is a combination of a traditional boiler with an air source heat pump. This technology is a particularly good option for homeowners looking to keep the familiarity of the boiler we all know so well but with the energy saving benefits of a renewable technology. 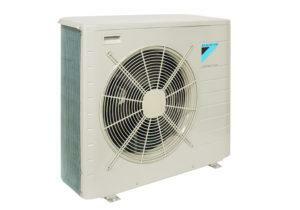 Daikin’s Altherma Hybrid is one of the most sophisticated examples of this technology. The smart system will automatically switch between the gas or LPG boiler and the air source heat pump, depending on which is the most economical or ecological operation. It can also be monitored and controlled from a simple app on your smart device for maximum convenience. It will work in even the coldest UK temperatures to provide both heating and hot water and if either the boiler or heat pump were to break down, the other would kick in so you won’t go without hot water or heating. If you’re replacing a gas or LPG boiler then an Altherma hybrid is a relatively straightforward installation. The system includes a Combi boiler which can simply replace your existing boiler, connecting to your radiators or underfloor heating, as well as an air source heat pump which is installed outside the home. It can also be installed alongside a separate hot water cylinder or solar thermal system to increase the hot water supply for larger homes. The heat pump element of a hybrid system is eligible for the RHI scheme so could your system could be earning you money at the same time as reducing your energy bills. Find out more about Hybrid heating systems here. What About Heating in Off-grid Homes? However, the UK’s trade association for oil fired appliances, OFTEC (Oil Firing Technical Association), argues that replacing oil boilers is not the solution for off-grid homes. Stage 1 from 2018 – 2022: incentivise the replacement of existing standard efficiency oil boilers with high efficiency condensing appliances through a nationwide boiler replacement programme. This should be supported by mandating heating controls such as functional timers and thermostats when new boilers are installed to further reduce energy use. Stage 2 from 2022: introduce a low carbon liquid fuel as a replacement to kerosene. OFTEC believes that this strategy will address carbon reduction and energy efficiency simultaneously and means that homeowners won’t have the high upfront cost of replacing an entire heating system. In addition, replacing the fuel rather than the boiler will mean there will already be a network of engineers and suppliers in place to support the transition. Interested in a renewable heating system? Get FREE quotes from registered engineers today. In many ways solar thermal is similar to solar PV, but rather than turning the sun’s energy into electricity this system uses it to heat your water. This solar heated water can supply a wet central heating system as well as your taps, baths and showers. By using the sun’s free energy to heat your water you will need to use your boiler less. This means cheaper heating bills, lower carbon emissions and less strain on your boiler. A solar thermal system is also eligible for the government’s Renewable Heat Incentive (RHI) scheme which will pay you for the energy generated by the system on a quarterly basis for 7 years. Find out more about Solar Thermal heating here. Note: If you have an electric heating system or an immersion heater then solar PV panels will generate electricity for these systems. A biomass boiler is like the standard gas and oil boilers you find in most homes, but it is fuelled by solid biomass rather than gas or oil. Biomass is biological material that comes from plants or plant-based organisms. When it comes to domestic boilers this material is usually wood logs, chips or pellets. It is eligible for the government’s RHI scheme. Burning wood, on the other hand, is a carbon neutral process which means it only produces as much carbon dioxide as the tree absorbed while it was growing, cancelling itself out. As a naturally occurring fuel like coal it is much more sustainable. Unlike coal, wood does not take millions of years to form. In addition, UK landfill sites take in millions of tonnes of waste wood every year. This means that using wood as fuel is not only healthier for the planet’s atmosphere but will also take the strain off our landfill. Find out more about Biomass Boilers here. What Should Homeowners Do Now? If your current oil, LPG or coal heating system is on its last legs or operating inefficiently, now may be the time to consider a renewable alternative or, at the very least a new, more efficient oil boiler. Homes on the gas network have a little more breathing space, but should only be installing only the most efficient boilers to minimise their carbon emissions and (where possible) combining their gas boiler with a renewable system like solar thermal or a heat pump. New builds are our biggest opportunity to ensure renewable systems and effective insulation are integrated into our homes going forward, but as current homeowners we should consider (and be as open-minded as possible) about renewable energy as part of any renovations or extensions. The main thing to remember – and it’s what is making the issue so complicated – is that there will be no one size fits all solution to the future of UK heating. The technology which works best in a 5 bedroom remote, farmhouse can’t be applied to an inner city 2 bed terrace. Households with lower incomes cannot be expected to meet the upfront costs of renovations without financial support and every family lifestyle and routine is unique. As the government and the energy industry continue to research, test and debate the long term future, if you’re looking to make a change to your home heating now, we recommend that you talk to multiple professional heating engineers and work with them to find the right technology for your home and lifestyle. Reputable and professional heating engineers have a responsibility to recommend heating solutions which are in your best interests and should be advocating the most energy efficient option where possible.